The Conservatory consists of the main house and four corner houses. 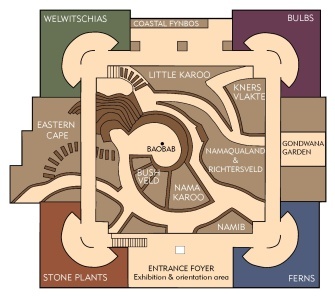 Each bed in the main house represents an ecological region or biome of southern Africa and contains the rocks and soil found in that region. The four corner houses display ferns, bulbs, welwitschias and stone plants. Click on the links below, to explore them.